Our Phoenix office was founded by Harvey Streich and Tom Lang in 1970, as the successor to one of the earliest law firms in Arizona, founded in 1905. Mr. Streich had a vision of a firm with a national presence, so he actively recruited attorneys from around the country, building a culture and presence unlike that of any other firm in Arizona. Meanwhile, Quarles & Brady had established a small office in Phoenix in 1988. Quarles was already one of the largest firms in Wisconsin, but its executive committee recognized Phoenix as a great market in which to grow further, and Streich Lang was clearly one of the best firms in Arizona. Thus, in October 2000, the two firms merged — at first calling ourselves Quarles & Brady Streich Lang but then simplifying to Quarles & Brady in 2005 — and our Phoenix office became the southwestern anchor of a growing national practice. As the 48th state, Arizona is a relative newcomer to the Union, but its roots are ancient history. For more than 1300 years, Arizona has been home to some of the most dynamic, resourceful, and energetic civilizations. Although one of the earliest Native American communities — the “Ho Ho Kam” — mysteriously disappeared from the desert before the arrival of European settlers, their legacy is evident in the ancient Pueblo Grande ruins and in the elaborate system of irrigation canals they developed, which made life in the desert possible. Like the mythical bird from which it takes its name, Phoenix rose from the ashes of its own extraordinary past. 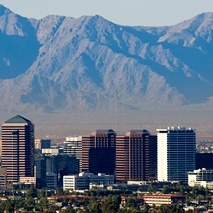 Today, the Phoenix metropolitan area (“ the Valley of the Sun”) clearly reflects its unique historical origins and its distinctive Southwestern character. With 21 Native American tribes across the state, its close proximity to Mexico, and a constant influx of newcomers from around the world, Phoenix offers a diverse cultural, legal, and business environment that is ancient in some respects and ultra-modern in others. Now the fifth-largest city in the United States, Phoenix consistently rates among the best-run cities, the best places to live, and the best major metro areas for starting and growing a business. The state’s economy, once based exclusively on farming and mining, thrives on tourism and high-tech manufacturing and development. Arizona State University, located in Tempe, is a level-one research institution that attracts students and scholars from across the globe. A warm climate, affordable housing, and a resilient economy keep them here. A relaxed lifestyle also contributes to the exceptional quality of life in the Valley. Cactus League Baseball, featuring nine major league teams in Phoenix and three in Tucson, jump starts baseball season every March. Throughout the summer, the Arizona Diamondbacks play at the state-of-the-art Chase Field, in Phoenix’s Copper Square, where the fledgling 2001 Diamondbacks defeated the New York Yankees in one of the most exciting games in World Series history. Rounding out the professional sports teams are the Phoenix Suns (NBA), Phoenix Coyotes (NHL), and Arizona Cardinals (NFL). The Valley also hosts college football’s Fiesta Bowl, the PGA’s Waste Management Phoenix Open and, in 2008, the Super Bowl. With an average of 300 days of sunshine per year, Valley residents take full advantage of outdoor recreation: An extensive urban trail system affords hiking, cycling, and horseback riding, while nearby canyon lakes offer water skiing, boating, and fishing, and two hours to the north of the Valley there is snowboarding and downhill skiing during the winter months. Dining out in Phoenix combines the best of the Old West with the cosmopolitan diversity of a world-class city. Weather permitting (and it usually is), diners enjoy patio seating at a wide array of restaurants, ranging from the trendy bistros of Scottsdale to funky ethnic fare tucked away in the central city neighborhoods. Perhaps the most popular cuisine is Mexican, reflecting the variations of its distinctive regional origins, from the traditional to contemporary, and from spicy to mild. You’ll also find Greek, Thai, Chinese, Italian, Japanese, Cuban, and French cuisine (and at the Arizona State Fair, one should not skip the Indian Fry Bread!). Local museums reflect the unique character of the desert southwest and the heritage of its earliest inhabitants. The Heard Museum is internationally renowned for its collections of Native American and Southwestern art and artifacts. Several annual events, including the Championship Hoop Dance Contest and the Indigenous Film Festival, celebrate Native American culture in the park-like setting of midtown Phoenix. Further south, the Phoenix Art Museum, after a recent expansion, is among the largest visual art venues in the Southwest. With more than a half-million visitors each year, the museum recently achieved record attendance with its exhibition “Masterworks from El Greco to Picasso in the Phillips Collection.” With a more contemporary feel, the Arizona Science Center features more than 300 hands-on exhibits that allow patrons to interact personally with science and technology, while the recently completed Challenger Space Center allows visitors to explore the mysteries of the universe and the wonder of discovery. The Phoenix Children’s Museum also engages the imagination with hands-on, interactive exhibits. Further points of interest include the Desert Botanical Garden, the Phoenix Zoo, and Frank Lloyd Wright’s Taliesin West, home of the Frank Lloyd Wright School of Architecture and the Wright foundation and archives. The main campus of Arizona State University (ASU) lies in Tempe, just 15 minutes from central Phoenix. Established in 1885 as a teacher’s college, ASU today enrolls more than 57,000 undergraduate, graduate, and professional students on three campuses in the metro area. ASU’s extended campus in downtown Phoenix offers various academic programs and professional certificate programs. In addition to ASU, the valley is home to the Thunderbird School of Global Management — recently ranked by U.S. News & World Report as the number-one graduate program in International Business for the eighth-consecutive year — and the University of Phoenix, the largest private university in the United States. With a wide range of distinctive venues, Phoenix attracts the finest music, dance, and theater productions from around the world. The historic Orpheum Theater built downtown in 1929 as a movie house and vaudeville theater, combines ornate Spanish Baroque Revival architecture with state-of-the-art production technology. The opulent Gammage Auditorium, on the ASU campus, originally designed by Frank Lloyd Wright as an opera house, hosts musical, theatrical, and operatic productions. Symphony Hall is home to the renowned Phoenix Symphony, Arizona Opera, and Ballet Arizona, while the Herberger Theater houses the Arizona Theater Company, the Center Dance Ensemble, and Childsplay. Larger events are staged at the innovative Dodge Theater, a facility designed to accommodate concerts, Broadway shows, and professional boxing matches, as its moving side walls can transform an intimate proscenium theater into a modern, fully-equipped sports arena as needed. Phoenix also regularly hosts special events such as The Scottsdale International Film Festival. Dia de los Muertos, or Day of the Dead, is a Mexican Halloween tradition that merges the Catholic Feast of All Soul’s Day with Native American rituals of death to celebrate the unity between life and death; Artlink First Fridays is a self-guided tour of galleries and studios in central Phoenix; and Art Walk is a walking tour of Scottsdale’s 100-plus art galleries every Thursday night, featuring food and entertainment. Sedona and Flagstaff are nearby and offer a beautiful escape for weekend getaways.